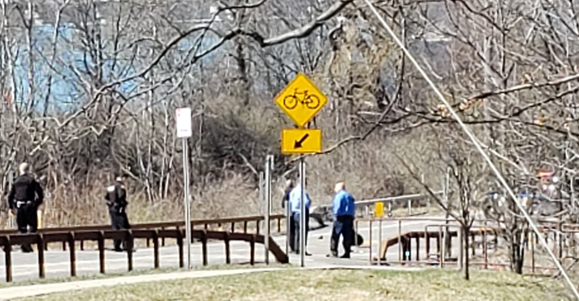 I recently received an email from a Twin Tiers resident concerned about bicyclists riding on sidewalks and on the wrong side of roadways. 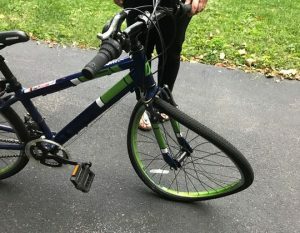 I was copied on the email that was sent to his mayor and police chief after the man almost struck a bicyclist riding on a sidewalk. 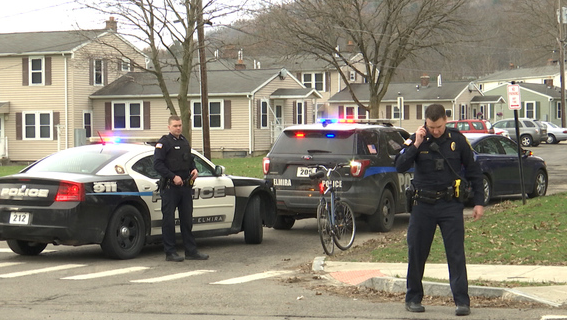 The man was turning right into a parking lot and a speeding bicyclist, the resident said, was riding on the wrong side of the street in his path to the parking lot. 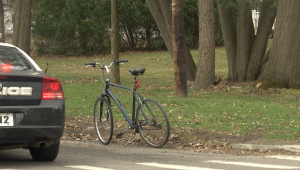 The bicyclist was on the sidewalk and behind a fence, so he was hard to see, the man said. 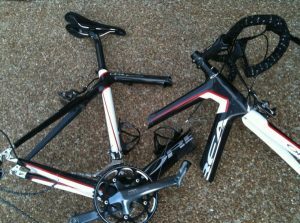 The resident was able to stop before hitting the bicyclist. 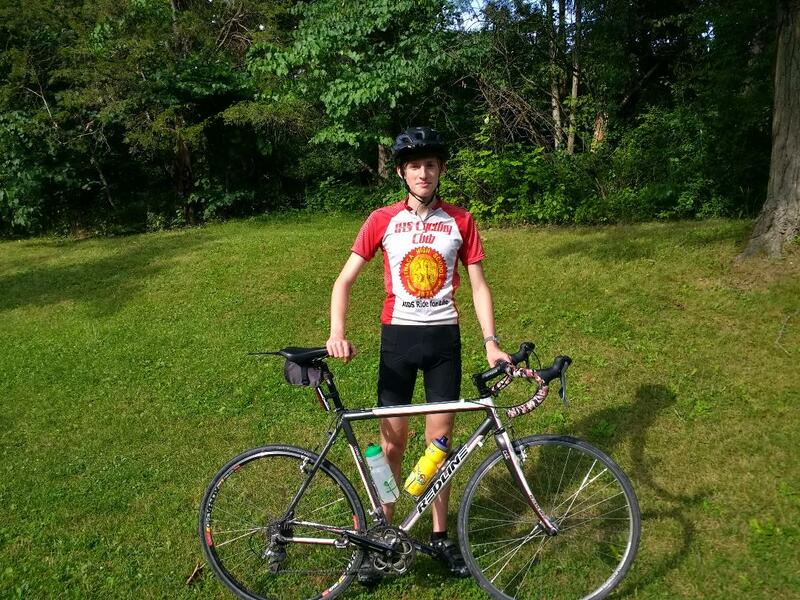 The resident stopped by the police department and talked with officers, remarking that he was taught as a child to ride in the road – and ride on the right side of the road, with traffic. 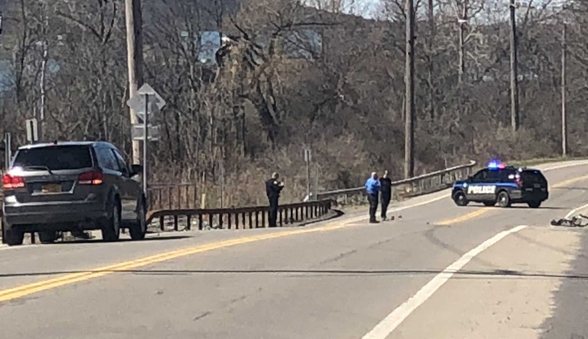 He said two police officers told him that pedestrians (the bicyclist, in this case) always have the right of way, and police have no power to tell bicyclists where to ride on roadways. The man then correctly cited part of NY Vehicle and Traffic Law 1234 (regarding riding on roadways, shoulders, bicycle or in-line skate lanes and bicycle or in-line skate paths): (a) Upon all roadways, any bicycle or in-line skate shall be driven either on a usable bicycle or in-line skate lane or, if a usable bicycle or in-line skate lane has not been provided, near the right-hand curb or edge of the roadway or upon a usable right-hand shoulder in such a manner as to prevent undue interference with the flow of traffic except when preparing for a left turn or when reasonably necessary to avoid conditions that would make it unsafe to continue along near the right-hand curb or edge …. 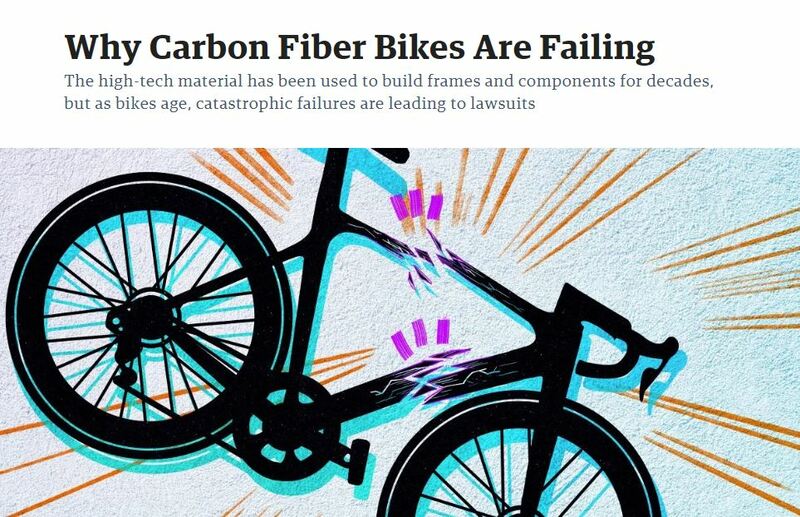 As a lawyer who handles a significant number of bicycle crash lawsuits, I can tell you that the vast majority of time it is the cyclist, not the motorist, who is blamed for causing a collision. I can’t tell you the number of times I have had to prove that an accident report was erroneous in claiming the bicyclist was at fault when in fact the motorist violated the NY Vehicle and Traffic Law. My feeling is that our laws should be applied equally to ALL users of our roads — motorists, bicyclists, pedestrians. Likewise, proper education is important for ALL users of our roads. 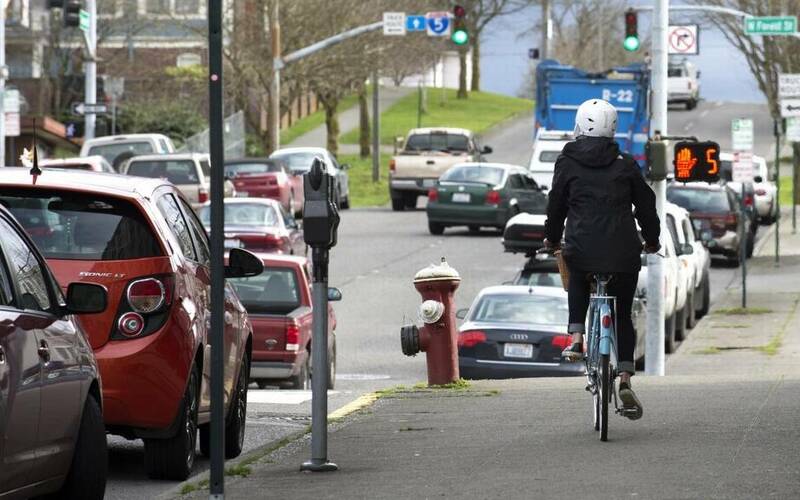 Yes, I see bicyclists, pedestrians and motorists sometimes obeying the laws, sometimes violating the law, and accordingly, I think it’s important that we don’t jump to the conclusion that all bicyclists are bad or that all motorists are bad. I appreciate the fact that you are creating a dialogue about proper bicyclist/motorist behavior. I regularly lecture on NY bike laws to law enforcement, and in fact, I recently lectured to the Steuben County Magistrates Association, where many of the 52 village and town justices in Steuben County were in attendance. 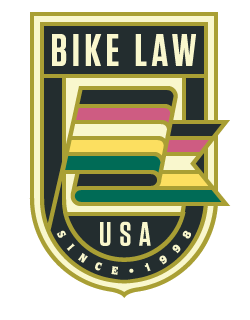 If you or anyone in law enforcement ever have questions regarding NY bicycle laws, please let me know and I would be happy to offer my analysis. Under NY law, you are correct that bicycles are supposed to ride in the same direction as vehicle traffic, not against traffic. And most NY municipalities have laws prohibiting bicyclists from riding on sidewalks if the rider is older than 12 years old. 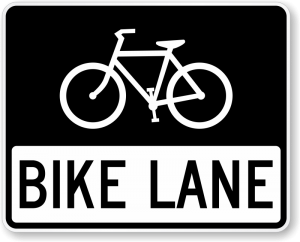 And finally, although VTL 1234 does say a cyclist should ride to the right of the road when it is safe to do so, a bicyclist IS permitted to use the full travel lane when necessary to ride safely (i.e., when making a left turn or when parked cars, road debris or potholes make the right side of the roadway dangerous). “I do not know what officers you talked with or when, but if they told you that bicyclists are somehow immune to the law, they were incorrect. 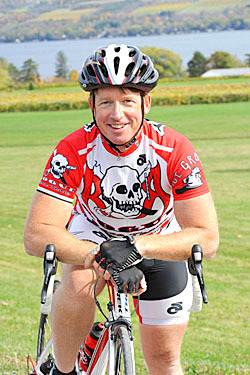 “You accurately cited one of the sections of the NYVTL that identifies the manner of which bicycles should be ridden. “In addition to this, there are City Codes that further identify proper bicycle operation and restrictions to riding in certain areas, including the downtown area. Through our School Resource Officer, we try to educate children of their responsibilities when operating bicycles, and offer a program for free helmets for those children in need. “By your letter, it is not clear to me the age of the bicyclist (child or adult), as this certainly factors into the options that are available to the officers. 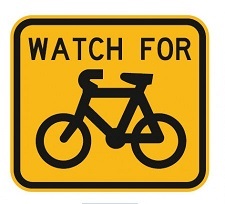 Regardless, with warmer weather upon us, there will be more cyclists out and about, making it imperative that persons operating motor vehicles do such with due care and caution. It’s great to see a police chief admit his officers made a mistake and that he plans to educate his employees and increase enforcement. For our roadways to be safer, everyone has to do their part – motorists, bicyclists, motorcyclists, and pedestrians – and follow the laws. And always be mindful that there will be those who ignore the law. This entry was posted in Bicycle accident lawsuits, Bicycle Accidents, Bicycle Collisions, Bicycle Laws, Bicycle Safety, Bike accident lawsuits, Bike accidents, Bike collisions, Risks for Bicycle Riders, Uncategorized and tagged accident attorney, accident lawyer, Bicycle, bicycle accident, bicycle accident attorney, bicycle risks, Bicycle Safety, bike accident, Cycling, Elmira, Elmira New York, James B. Reed, Jim Reed, Law, Lawsuit, New York, New York bicycle accident lawyer, ny bicycle accident lawyer, ny bicycle cases, pa bicycle accident, pa bicycle accident lawyer, pa bicycle law, Traffic collision, Twin Tiers, Ziff Law Firm on May 15, 2018 by Jim Reed. 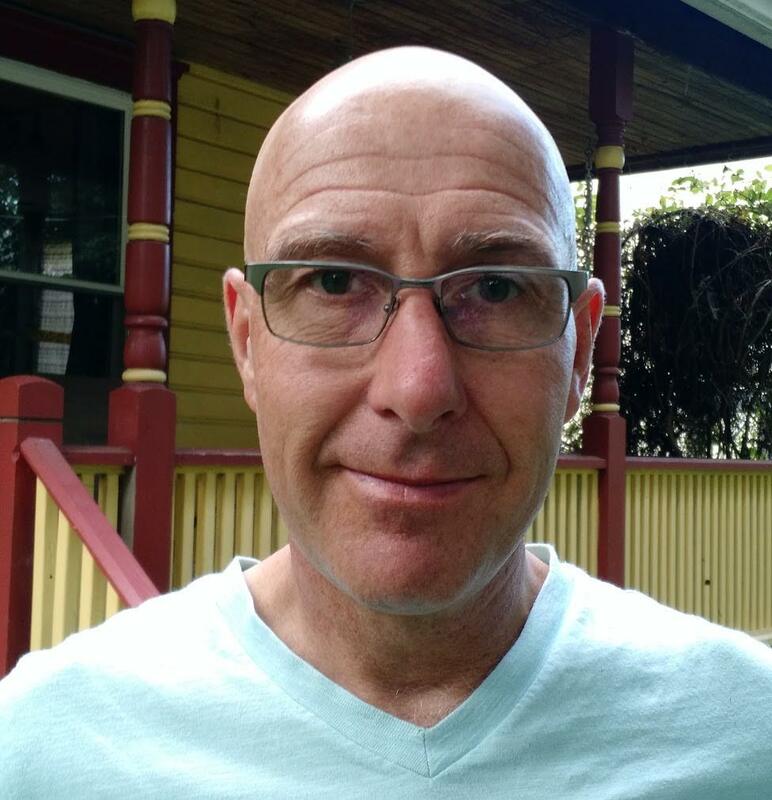 A few months ago, I began writing a column for The Odessa File (photo above), a must-read community news website in Schuyler County. Since my wife and I live there now, I wanted to find a way to connect with my fellow residents, and I know that everyone in the county reads it. 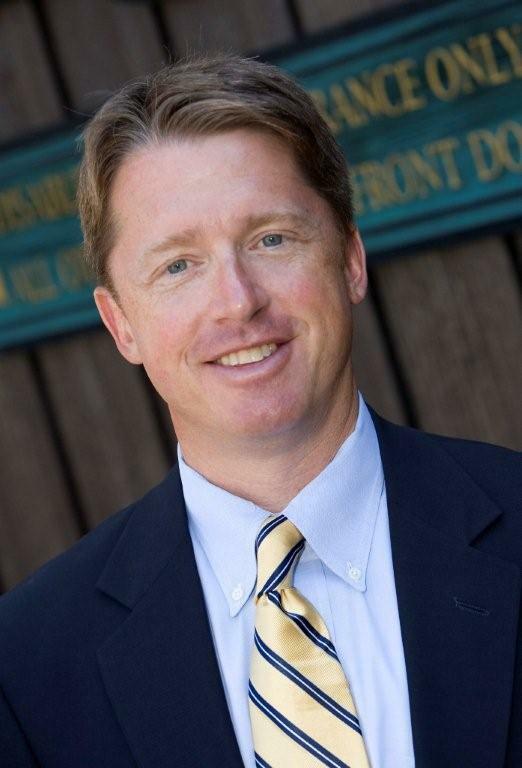 Charlie Haeffner has created a great resource for county residents, and I will say it again: Everyone. Reads. It. The feedback has been great and people are coming up to introduce themselves on the street when I am out in the community. It’s been a great icebreaker. I just published my fifth column this year. I write about legal news that people can use in their everyday lives. I have written about a great insurance change in state law for New York State drivers; about how a woman’s tragic death has led to a positive change in another state law; and about how writing wills can be a messy process for families. 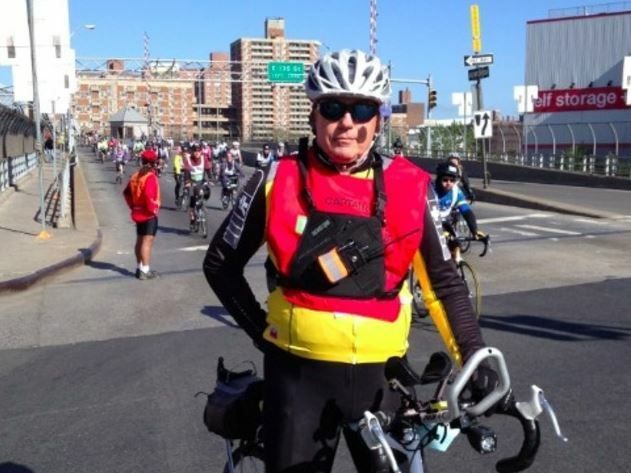 My latest column is a wake-up call for New York motorists and bicyclists. The hibernation is over. The snow is gone for good (I hope) and bicyclists are getting their bikes out of the garage and checking their brakes and tires. 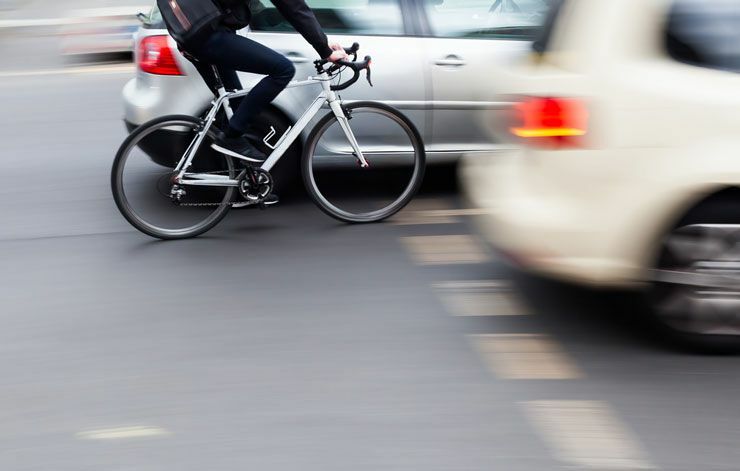 As we all prepare to hit the road again, and dodge the horrible potholes that winter left behind, it’s time to remind everyone on the road what the law says about the rights of motorists … and bicyclists! So please. 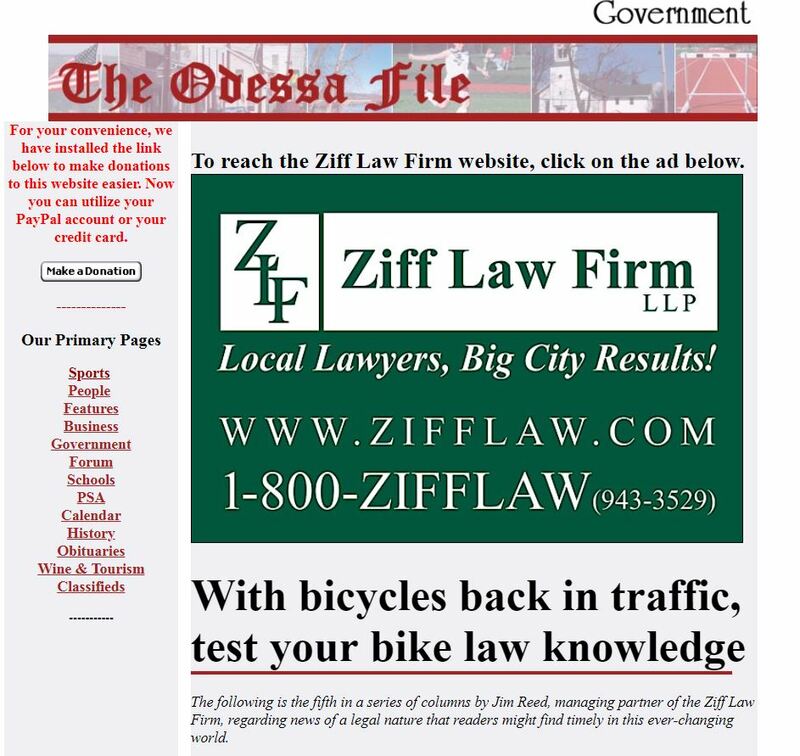 go read the terrific Odessa File website and read my column. As a bonus, I have a brief quiz in the column that will test your knowledge about basic bike laws in NY. If you email me your answers, I will enter you in a drawing for a $50 gift card to a great Watkins Glen restaurant. 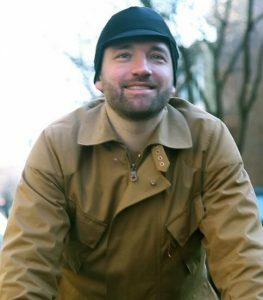 You can also email me at [email protected] f you’d like a very readable and easy-to-understand primer on NY laws for bicyclists. It’s a great refresher so we all have another safe year of sharing our roads with drivers, motorcyclists, and pedestrians. This entry was posted in Bicycle accident lawsuits, Bicycle Accidents, Bicycle Collisions, Bicycle Laws, Bicycle Safety, Bike accident lawsuits, Bike collisions, Cool Stuff for Bicyclists, Schuyler County, Uncategorized and tagged accident attorney, Bicycle, bicycle accident, bicycle accident attorney, bicycle risks, Bicycle Safety, bike accident, Cycling, Elmira, Elmira New York, Injury, James B. Reed, Jim Reed, Law, Lawsuit, New York, New York bicycle accident lawyer, ny bicycle accident, ny bicycle accident lawyer, ny bicycle cases, pa, pa bicycle accident, pa bicycle accident lawyer, pa bicycle law, Twin Tiers, Ziff Law Firm on April 16, 2018 by Jim Reed.